Summer weather = dry skin for me. So when Trusted Health Products offered me the opportunity to try their newest skin care product, Amazingly Beautiful Body Moisturizer and Revitalizer, I couldn't wait to get my hands on it. My friends at Trusted Health Products have some of the best beauty and personal care products I've ever tried. I enjoy working with them to share new products with y'all! This silky moisturizer is made with natural products you can easily identify - almond, avocado, and olive oils, plus lemon, lime and orange oils. It smells amazing - like juicy, fresh-cut citrus fruit. It leaves your skin feeling super-soft and moisturized. It is suggested that you apply this moisturizer immediately after showering and that is what I do. I was a little worried that it would take a long time to be absorbed, as it is an oil based moisturizer. I discovered that isn't an issue at all. This oil is very light (NOT greasy feeling!) and absorbs quickly into my skin, leaving it moisturized for hours. And did I mention the delicious fragrance? It's incredibly rejuvenating - it perks you up while making your skin gorgeous, too. There is nothing I don't love about this product. We have discovered that certain combinations of potent plant extracts – with “living nutrients” still intact – perform unbelievably well when interacting with other living cells. The key is in the way our bodies’ living cells absorb these nutrients. This process acts like “Miracle Grow” for your skin cells and delivers stunning results while nourishing your skin just the way it likes it. Amazingly Beautiful’s 100% pure live ingredients are the perfect living “foods” that your skin cells need in order to be fed the nutrients they need to stay clean, moisturized and revitalized on a daily basis. Lime – Anti-bacterial, anti-fungal skin cleanser. For a limited time, the manufacturer is willing to offer my readers one FREE bottle. They said they would love to have our readers try outAmazingly Beautiful Body Moisturizer And Revitalizer and agreed to send one bottle FREE if my readers pay a minimal shipping and handling charge. This is a one-time only offer! Click here to get your FREE bottle now! 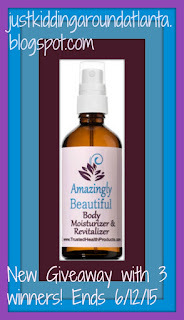 You – or anyone in your household - may win one bottle of Amazingly Beautiful Moisturizer and Revitalizer one time only. Previous winners please do not apply. Now time for the GIVEAWAY!! Three lucky winners will receive their own bottle of this wonderful moisturizer ~ all you have to do is enter via my Rafflecopter Widget below! Retail value is $39.95 per bottle. Good luck! I think it's great that this isn't greasy and is light. I love oils but hate when they feel heavy.